There is an enchanting nature to Burma (Myanmar) that shines along thousands of ancient temples and pagodas and through a culture that truly remains a world apart. As a designer, to visit sacred places and get a taste for equally inspiring food that echoes authenticity of place was a dream. Touring was led by a Burmese college friend and provided a chance to see the country from a local’s perspective. 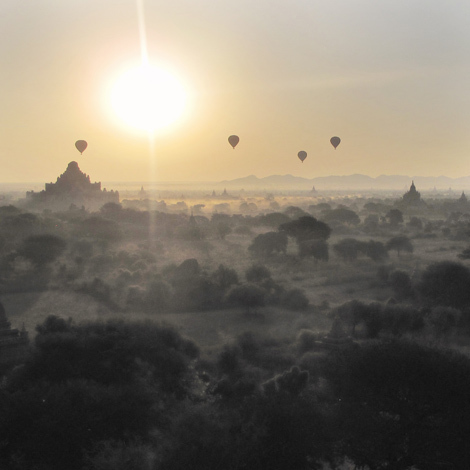 The ancient city Bagan was naturally a place of wonder, a vast flat landscape with thousands of Buddhist temples, built between 11th and 13th centuries. Farmland and dirt roads where tourists commute by bike or horse-cart force the adoption of an older pace of life. Rituals of waking in the night to scale monuments of stone and witness the sun rising over the great valley resonated deeply in the memory of this exotic land. Dining at local food favorites proved regionally diverse. It was an incredible assortment of handmade noodle soups, dried meets, curries, and barbeque seafood.